The Pac-12 is so bad that this is good stuff: A wild and woolly men’s basketball race hits the finish line this weekend. Utah could be seeded almost anywhere from No. 3 to No. 9 in the conference tournament. (Trent Nelson | The Salt Lake Tribune) Utah coach Larry Krystkowiak as the Utah Utes host the Oregon Ducks, NCAA basketball in Salt Lake City on Thursday Jan. 31, 2019. Utah would love to be known as one of the worst second-place teams in Pac-12 basketball history. The Utes really would like to remain above the No. 8 or 9 seed in next week's conference tournament. The Pac-12 standings remain so volatile that the Utes could land almost anywhere from No. 3 to No. 9 after this week's visits of USC and UCLA to the Huntsman Center. The top two and bottom two seeds have been determined, although the Utes could finish in a tie for second place with the right sequence of events, starting with two Utah victories. And then the Utes would have as much opportunity as just about any other team to win the Pac-12 tournament and claim an automatic NCAA Tournament bid. In that case, the Pac-12 could have three teams qualify. That would be remarkable in a season that’s historically mediocre for the conference, to use the most favorable label. Another possibility is that Washington wins the tournament and Arizona State drops out of at-large consideration, leaving the conference with only one NCAA contestant. The Sun Devils received a No. 11 seed Wednesday in ESPN’s Bracketology. The tradeoff for a lack of national-caliber teams is a crazy competition that comes down to the final week of the regular season for two-thirds of the teams. Six schools are separated by one game at 9-7 and 8-8, with Stanford and Arizona each another half-game behind at 8-9 and favored to win rivalry games this week. Washington (14-2) has clinched the regular-season title and Arizona State (10-7) is the No. 2 seed. But the Sun Devils could fall into a tie for second by losing at Arizona and having any of three teams sweep their remaining two games: UCLA, Oregon State or Utah. In any case, an 11-7 record would be the worst mark for a second-place team in the Pac-12 since 1990-91. Could the Utes rise to that level with two wins? That’s asking a lot of a team that has not played consistently well at the Huntsman Center and is challenged with defending two good offensive teams, starting Thursday night vs. USC. Utah beat both USC and UCLA on the road last month, yet any number — zero, one or two — of wins is a genuine possibility this week. So is a wide range of potential seedings for the Utes (15-13, 9-7 Pac-12) in the conference tournament. Two victories would guarantee the Utes a top-four finish and a first-round bye. One win might do it, depending on various tiebreakers. Two losses could drop the Utes as low as No. 8 or 9. That's how jumbled the standings are, and coach Larry Krystkowiak knows it. The Utes have a chance to post 11 conference wins and finish in the top four for a fifth year in a row. That would be an achievement for a team picked to finish eighth, with three freshmen and a sophomore among Utah’s top seven players. Yet if they fall to a No. 8 seed or lower with a 9-9 record, after once being in second place at 8-4, that would be a letdown. After reviewing last weekend’s 71-63 loss at Colorado, Krystkowiak was disappointed with the Utes’ effort, beyond their 5-of-26 shooting from 3-point range. They’ll need to respond with the kind of offensive and defensive work they produced in a 77-70 win at USC four weeks ago, when they led by 23 points midway through the second half. Records: USC 15-14 (8-8 Pac-12); Utah 15-13 (9-7 Pac-12). Series history: Utah leads, 23-19. Last meeting: Utah 77, USC 70 (Feb. 7). About the Trojans: USC is coming off an overtime loss to UCLA … Nick Rakocevic’s foul trouble was a big factor in the first meeting with Utah, as the Utes led by 20 points in the first half and maintained at least a 14-point margin until the closing stretch. He finished with 10 points and nine rebounds as USC shot 38 percent from the field. … Bennie Boatwright, the Trojans’ other frontcourt star, needed a late flurry to post 17 points and 12 boards. About the Utes: Jayce Johnson played a key role for Utah with 13 points and 13 rebounds against USC. … Utah is 3-4 in Pac-12 home games, going into the final week, with UCLA coming to town for Saturday’s Senior Night. … The Utes have not posted fewer than five Pac-12 home wins since the 2012-13 season, when they finished 5-13 in conference play. 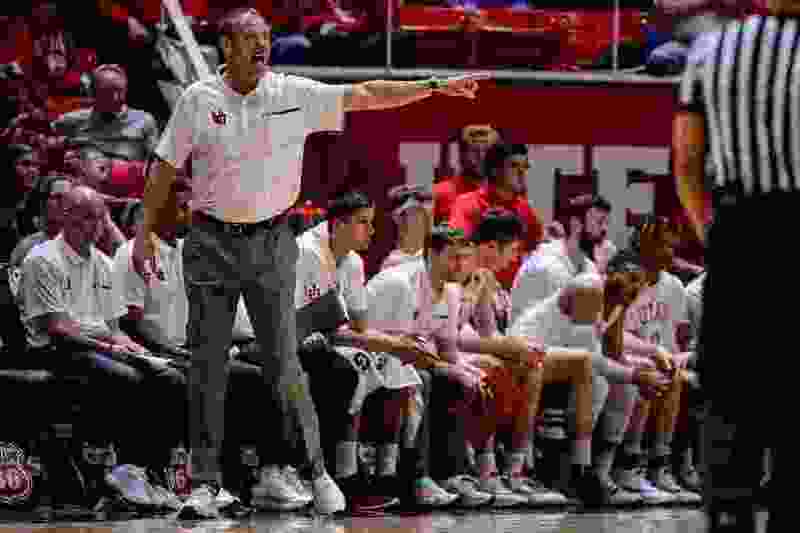 … Utah also needs two wins to have a better record (6-3) in the second half of league play than the first half (5-4), as Larry Krystkowiak’s teams often have done. … Utah’s announced average home attendance is 11,305.